With Green on guitar and some background singing Hot Chip recorded a cover of the song She Wolf (performed by Shakira) for a BBC radio 1 session. With compliments of Shakira herself. As a bonus, don’t miss the amazing I feel better clip, the new single of Hot Chip. Enjoy! 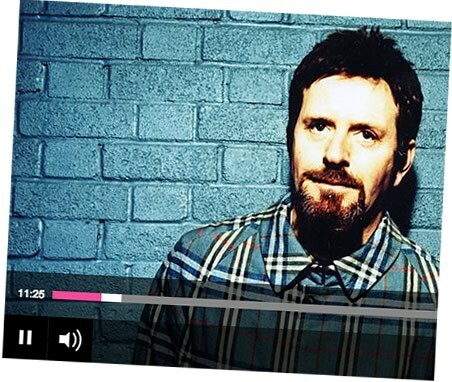 Last night Scritti Politti had a short, 3s ong acoustic session on Janice Long’s BBC radio 2 show. Dave, Dicky and Rhodri accompanied Green in a beautiful toned down rendition of Road to no Regret, Snow in Sun and After Six. Relexed interview, a really good listen this one. Some news on future plans: a collaboration with Alexis from Hot Chip (? ), vague talks with Elvis Costello, something with a New York symphony orchestra. The plan is to buckle down and do some work (i second that!). In the beginning of June something for Friends of the Earth. Last week Green had the opportunity to choose some of his favourite tracks for Ken Bruce‘s show on BBC Radio 2. A slightly different selection from the one published in the Itunes Music Store (see earlier post). On friday he talks about future projects. Two albums! A hiphop one and an album with ‘proper’ songs. Yummy..
Last evening on BBC 6 in Tom Robinson‘s show Tom interviewed Green and Snow In Sun and Robin Hood were played live accompanied by Dicky Moore on guitar and Alyssa … McLundough … (sorry, it’s quite hard to catch her surname, someone help out?) on bass. They talk about John Peel’s funeral, a Gamson produced Tony LeMans’ album, where Green did sing on – now I didn’t know that! At the end there is also some talk about the website, still not fully online, but hopefully people will find their way to bibbly-o-tek, cuz it’s the best! While you listen you might wanna check out some links. Imomus talks a bit about White Bread Black Beer. He refers to Simon Reynolds epigraph on K-punk‘s analysis of Green’s voice and the meaning of his lyrics. Now at one point i might wanna add my 2 cents. Not now though. For all you lucky people who are going to tomorrow’s free gig at the Tate, enjoy! Take pictures, maybe even film something. Send us stuff! We’ll be happy to publish it. This sunday 11th June on BBC Radio Wales an interview with Green will be broadcasted on the Adam Walton programme at 10pm. It’s possible to listen live through the internet or through the Listen Again option. We at bibbly-o-tek will of course capture the stream and post it here after the show! Just now on Dutch Radio 3 FM, in the Eighties Request Week, ABC’s Martin Fry mentioned Scritti’s Wood Beez as one his favourite eighties records. In his opinion Scritti Politti is an underrated band. There was also mentioning of the new Scritti album. After that they played Wood Beez. Lovely. Scritti is back for sure.